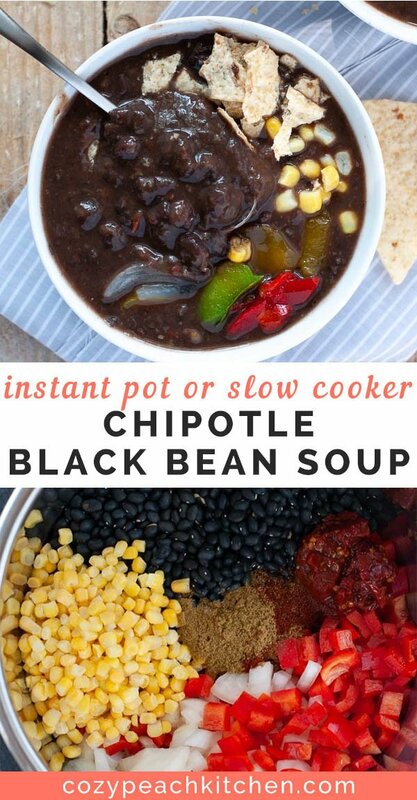 This chipotle vegan black bean soup can be made in an Instant Pot or slow cooker. It’s a great make ahead meal that’s loaded with nutrients and bursting with flavor! This post contains Amazon affiliate links. As an Amazon associate I earn from qualifying purchases; read my disclaimer policy for more information. Thanks for supporting Cozy Peach Kitchen. I know, I know, it’s still August. But I promise that I felt a chill in the air the other night. The humidity is slowly but surely decreasing, and I can pretty much smell the crisp fall air. Isn’t that an automatic excuse to transition my diet to chili, soup, and casseroles? Maybe not. But that hasn’t stopped me from having this soup on rotation all week long! This recipe was originally posted as a slow cooker (Crock Pot) recipe. I recently tried out this soup in my new Instant Pot, and I can’t believe how easy it was to make! There’s always a case to make for slow cooking, but pressure cooking currently has my heart. 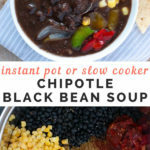 Recipes for slow cooker and Instant Pot black bean soup are included here, because this soup tastes amazing both ways! 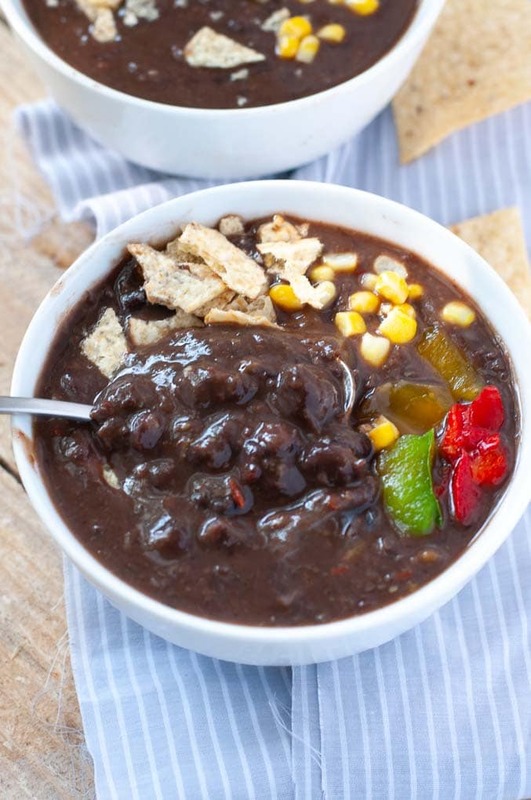 Chipotle chili peppers and smoked paprika pack a punch in this chipotle vegan black bean soup. Smoked paprika is my new favorite spice; adding just a little bit gives a whole new depth of flavor. 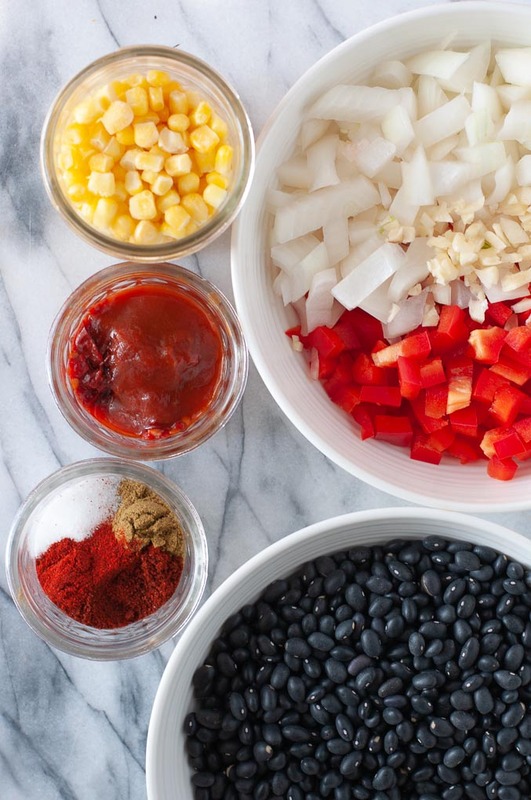 Black beans provide a host of health benefits. They’re high in soluble fiber, which helps to promote digestion. A diet high in fiber has also been shown to reduce the risk of heart disease by reducing inflammation. 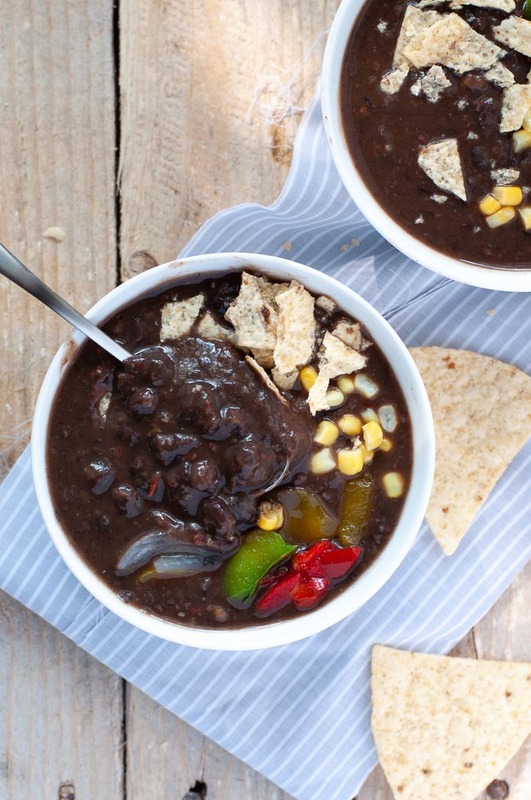 This black bean soup makes it easy to get in a healthy serving of black beans and fiber! Place the ingredients in your Instant Pot and cover with the lid. Set the steam valve to sealing. Cook on high pressure for 45 minutes, then release naturally for 10 minutes. Release the remaining steam manually, careful to avoid the steam. 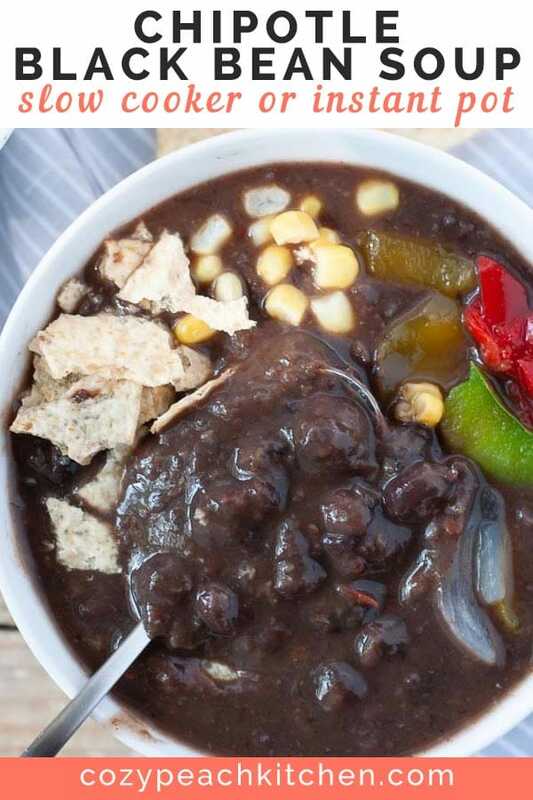 How do you like to top your black bean soup? I’m a sucker for anything crunchy, so I usually add crunched up tortilla chips. This soup is so flavorful on it’s own, but no good soup is complete without toppings. 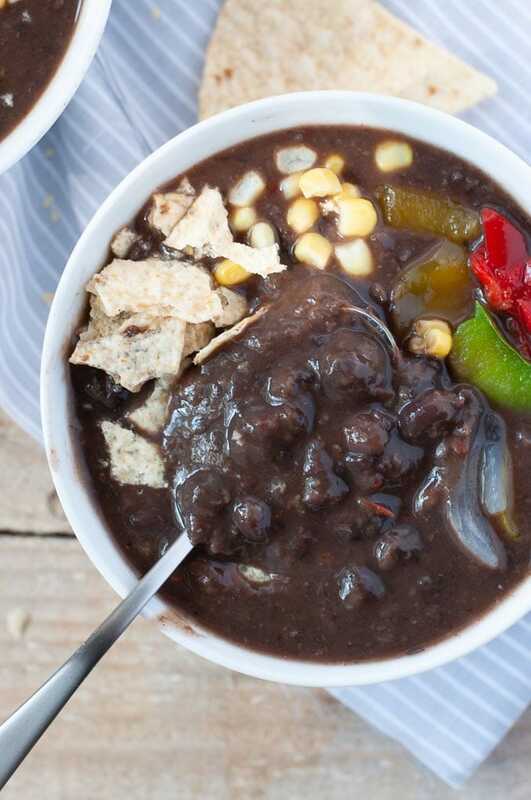 This lightly spicy and smokey black bean soup packs a punch of flavor. It can be made in your pressure cooker or slow cooker. 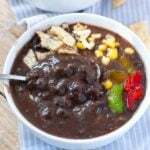 Cover the black beans in one inch of water and soak for at least 6 hours. After soaking, drain and rinse black beans, making sure to remove any stones or debris. 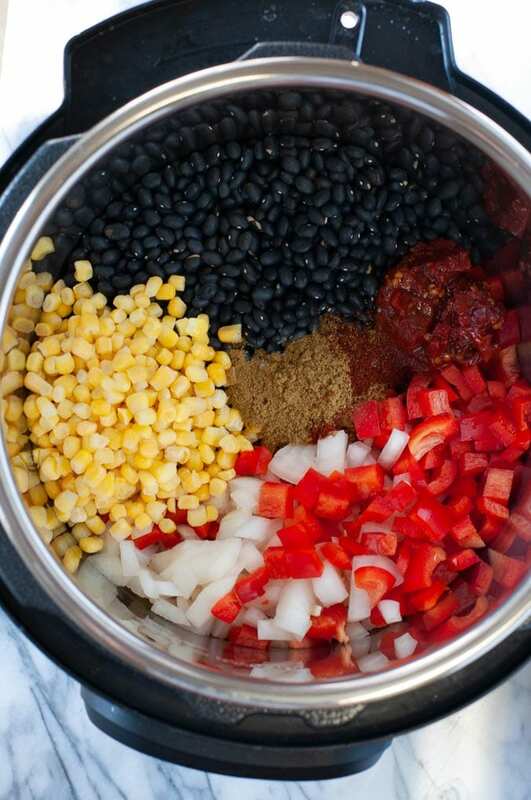 Add all ingredients to a large slow cooker. Cook on high for 7-8 hours, or until black beans are softened. Once the beans are very soft, use an immersion blender to puree about one third of the soup, or transfer one third of the soup to a blender. If using a blender, blend the soup in batches and be careful to not fill more than half the blender at a time., as the beans will release a lot of heat and steam. Return the pureed soup to the crock pot. Season with additional lime juice, hot sauce, and salt as needed. Place all ingredients in the Instant Pot. Close the lid and place the vent to "sealing". Cook the soup on manual high pressure for 45 minutes. Allow pressure to release naturally for 10 minutes, then release manually. Remove the lid, careful to avoid any steam. Use an immersion blender to puree about one third of the soup, or transfer one third of the soup to a blender and puree. If using a blender, blend the soup in batches and be careful to not fill more than half the blender at a time, as the beans will release a lot of heat and steam. Return the pureed soup to the pressure cooker pot. Serve with additional fresh peppers, corn, and tortilla chips. Store refrigerated in an airtight container for 5-7 days, or freeze in individual containers for easy access. Nutrition facts are an estimation and may vary based on brands used and method of preparation.